Joy is hosting Finishing Stitches, another stress free way of working on projects, but these ones are specifically from your stash of UFOs. Sounds like you will be busy Fiona...good to find stress free things to be doing though. 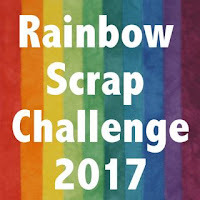 I am joining you in the Rainbow scrap challenge. Enjoy. You really got a lot of beautiful things made last month and the challenges look like fun ways to keep the projects moving and finished. Great finishes and challenges Fiona. I'll be joining you in OPAM and just trying to sew for enjoyment. Love the mini houses, how big are they? OOOh - you are such a temptress.... I am already in OPAM - and the one from Joy sounds easy enough too - so I'm off to join in...Been tempted by the rainbow one - but as much as I love your houses - I might go back to when they did crazy blocks...that sounds like a better option for me! ooh! will have to dig through the scrap bin for blue greens. Some lovely finishes there - you are so inspiring! Great collection of sea green fabric, I can only think of one print in my scrap bag that fits this colour :( But will have lots of fun looking for more! Purple blocks look great, especially the houses. Wow, you are getting organised! It is smart to only choose the challenges that are realistic for you. Good luck!! great way to keep motivated and inspired too. Great post Fiona - I keep looking at all the fabulous new projects there are to start (fresh projects for a fresh new year) but my Palace is groaning under the weight of all my previously started projects.... love those linkys you have listed for giving that little push that's needed to get those moved along somewhat.